In case you haven't been following Da-da's every move, this year he's taken on the mantle of Bad Mall Santa Da-da. The most important tactic in successfully portraying Santa is taking everything kids say at face value to discourage conversation and encourage the highest possible kid-santa throughput volume. Only one kid in 1000 is gonna remember your conversation anyway, if you could call it that, so you can pretty much say anything you want, so long as it's passive. Just channel a jolly and agreeable and hideously open-minded YES-MAN and you're golden. These aren't YOUR kids, after all. When they cry on Christmas morning because Santa didn't deliver that thermonuclear device or feline guillotine (sorry Calvin), you can smile and rest as assured as $9/hr can guarantee. Here was the highlight of today's Bad Mall Santa Da-da interface 3000. The kid looked like Puggsley from The Addams Family. Santa Da-da: Hi there, sport. What can Santa bring you this year? Puggsly: A gun. Or a pencil. Santa: Mmm. Santa can see uses for both. Puggsly: A pencil. One that transforms into something. Puggsly: No. The letter B.
Santa: A pencil that turns into the letter B? Puggsly: Yes. A gynormous one. 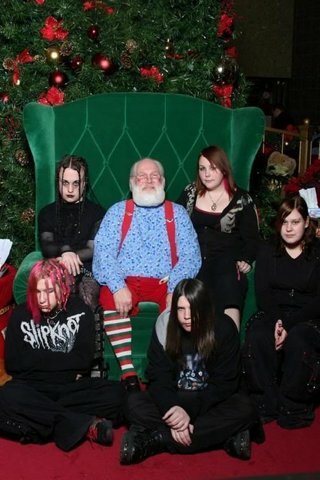 Santa: Sounds like fun. Anything else? Santa: Coffee. How would you like that? Santa: That's not coffee, kid. Puggsly: Ok, then a pony. With a head-horn. Santa: You mean a unicorn. Puggsly: Yeah, a unicorn. Pink! As big as a house! 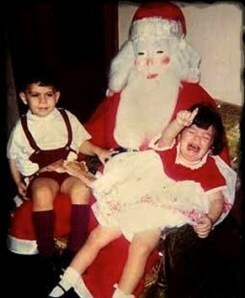 Santa: Sure, kid. I'll park it next to the gynormous B.
Santa, can I drink your blood?